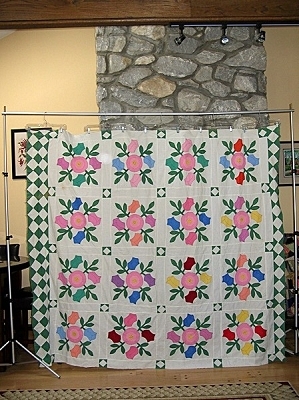 Vintage circa 1940s, closer to 1950s, quilt top measuring 82 inches by 90 inches. Pattern is a Roses Wreathe with a large pink flower with yellow center and 4 rose buds radiating in pink, blue, peach, yellow, green, and purple with green leaves and stems. There are 16 blocks each about 16.5 inches square, separated by 3 inch sashing with a 3 inch cornerstone of a square in a square. There are no borders on the top or bottom, a 7.5 inch wide border on one side, and a 3.5 inch border on the opposite side. It is hand appliqued with black embroidery thread, hand made French knots in the yellow center, and the top was assembled by machine. Condition is fair with some fading in the green fabric, age discoloration, and some raw edges peaking out from under the applique. There are also very faint pencil marks for the quilting in some of the blocks, just a cross hatch design.